The wet, windy, and stormy weather shortened most of our Maui rides and made the trip to Hana and back downright brutal at times, especially when climbing. The road conditions make for tense riding because it’s slick and unpredictable. Where you’d normally slice through the s-curves, with body english and power to the pedals, the red clay-slicked road means your riding with the bike upright and very carefully – clay buildup is also a problem. Riding Maui in the rain, beats 40 degrees in Seattle, but it’s still rain. 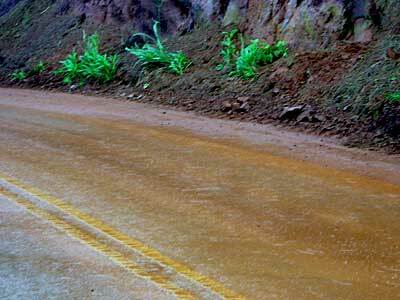 Haiku to Hana, Highway 360 – 70 miles, 3:15 (one way), tough climbing in the wind, rain, and slick conditions. Napili to the Bread Stand, Highway 30 – 35 miles, 3:00, constantly up and down, torrential downpour and clay runoff during the ride back. Mr. Steepy is always hard. Kihei to Napili, Highway 31 – Highway riding, mostly flat, but wind means small chain ring for most of it. During a 5 mile stretch, I was going 28 mph without pedaling, with a tailwind. Around Napili and Lahaina, Highway 30 – the condo loop, about 45 minutes on the highway and trafficked roads. For those readers into training and racing, I ride Maui for base miles at sub threshold. You can certainly go harder, but the steady, swirling winds and undulating terrain are very good to ride a heart rate tempo. It’s also surprising how hard a gentle climb is when facing the trade winds. Also, considering the wind and terrain, I ride time and not miles. The Modal in geared mode performed as expected – very well. It’s built for performance riding and adept at climbing, cornering, and all-day riding. The Ti frame is comfortable, precise, and controlled with minimal road vibration and shock (as you’d expect from a quality Ti frame, built by Bill Davidson). I’ll adjust the sliders for more road clearance and swap cassettes to a 27 next time. Previous Previous post: Should Seattle license cyclists?